Today I received the following 19 free energy-saving tips (click image for original article). I quote the article here with my own observations. Saving energy isn’t just about helping you to save electricity or be more energy efficient — it’s also a great way to save money. We all know we could do more around the home to save energy, but where to start? While some of the biggest energy savers require time and money there are still plenty of lifestyle changes you can make that will save energy, and money. With just a few simple changes to your lifestyle and your home, you could be saving hundreds of pounds on your heating, gas and electricity bills. 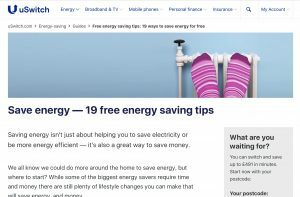 So, if you’re looking for ways to cut down on your spending, try these 19 free energy saving tips. Stay warm, cut costs. Turning your thermostat down by 1°C can save you as much as £60 per year. Also, keeping your heating on constantly on a low heat could potentially save you more money than switching it on and off for big blasts of heat. This is where getting to know and understand the timer settings on your thermostat will really pay off. That I can see both ways. On the one hand not stressing a condensing boiler too much can keep it in condensing mode, and thus increase its efficiency. However keeping the home unnecessarily hot will increase the heat loss to the outside world (which is proportionate to the temperature difference between inside and outside) so an unoccupied house at an elevated temperature will increase heat loss, but might make heat more efficiently. Also for many people, timers and thermostats are two different components and the use of the timer turns the heating on and off – not between two alternative temperature set points. Our own smart heating does in fact switch between a high and low temperature (not on and off) but at 10C the low temperature is such that room temperatures don’t generally fall to the low temperature before high temperature is demanded again. Turn the pressure down on the power shower. A high-pressure power shower is a great luxury to have but you’d be surprised how much water they use – sometimes even more than a bath. Save time and stock up. If you’re going to use the oven, bake a few meals at a time to get the most out of having your oven on. After all, oven’s don’t allow us to heat one shelf at a time so why waste your heat? Heat your home with cooking. Leave the oven door open after cooking to let the heat warm your kitchen. The oven might give off enough heat for you to adjust your thermostat, a far more efficient use of that stored heat than throwing it out of your home with an extractor fan. Heat from the oven after cooking certainly does heat the kitchen, but personally I would wouldn’t leave the oven door open which provides too much of a heat rush – I prefer to leave the door closed and allow the same heat to move into the room more slowly. I wouldn’t adjust the thermostat – it’s goal is to control to a comfortable temperature. Does the comfortable temperature change when you’re cooking? If you’re too hot when cooking the thermostat (potentially a TRV in the kitchen) will already have turned the heating off. As to extractor fans, their purpose is to remove steam from boiling pans and save energy by significantly reducing condensation. Turning off the extractor fan while generating steam is a false economy. Let the dishwasher do the dirty work . Avoid pre-rinsing the dishes in hot water. Save water and energy by just scraping the dishes before they go in. Make things easy for your fridge and freezer. Keeping them full means they don’t have to work as hard and therefore they use less energy. Empty space in your fridge or freezer wastes not only space but energy too. Again not so sure about this one. In general the energy to run a fridge or freezer will be a function of the temperature difference between inside the freezer and the room in which it is found. I can have assume that this point relates to the frequency at which the door is opened where an empty upright fridge or freezer will rapidly dump cold air into the room, whereas a full fridge or freezer has less cold air to dump. Use the right ring for the right thing. If your cooker has a small ring, use a small pan. You might only be heating up a small meal, and doing so in a big pan wastes a lot of energy. Conversely if you try and heat a large pan on the small ring you’re more likely to end up heating for longer than saving any money or energy. Shrink your bills, not your clothes. 90% of a washing machine’s energy expenditure is spent on heating the water, so if you wash your clothes at 30-40 °C you’re saving significant amounts of money. Hang up your laundry. Air-dry your laundry rather than tumble drying it, particularly if there’s warm or windy weather. What’s more nothing smells better than air-dried clothes. Save yourself ironing time. Take your clothes out of the dryer before they’re completely dry – they’ll iron much quicker and you’ll use less energy on your drier. Switch it off and save. Unplug all the appliances that you aren’t using regularly – even chargers continue to use electricity when they aren’t charging. Also, make sure you’re not leaving appliances on standby: it may be easier but it’s also a guaranteed way to waster energy compared to turning things off at the socket. Get the kids involved. Play energy-saving games with your kids. Get them to spot the areas in the home where energy is being wasted and where lights, switches or appliances have been left on. Let the sunshine in. On a sunny day, opening your curtains will let warmth into your house, but when it’s colder or the sun goes down don’t forget to close them to keep that heat in. Get free cavity wall insulation. There are now government-backed full and partial grants available to help you pay for insulation if your home has cavity walls. Getting this done could save you around 15% on your fuel bills, so you could be saving on average £98 a year. Even if you don’t receive money from the government insulation is still worth it in the long run. Get free loft insulation. Because heat rises, as much as 25% of the heat in your house could be disappearing into your loft space. What’s more, even older properties that already have insulation in place may not have the recommended levels, particularly if it was installed in the 1970s or 1980s. If you apply for a loft insulation grant, you could save about 19% on your fuel bills – which works out at an average of £128 per year. Get free solar panels. Having solar panels installed on your house could save you as much as a third on your electricity bills. What’s more, thanks to the government’s Feed-in Tariff scheme solar panel installers get paid for the energy generated, so they may install them for free. Indeed they might install them for free, but they do so because they get a good return on their investment via the feed-in tariff. If you have the capital available pay for it yourself, get the feed-in tariffs for yourself, and avoid any legal issues with rent-a-roof if you choose to sell your home in future. Apply for an energy-saving grant. There are plenty of energy-saving grants available to help with the cost of home improvements. Compare gas and electricity prices with to make sure you’re on the cheapest tariff for you. It only takes a few minutes. This entry was posted in General Tips on 05/11/2017 by Greening Me.